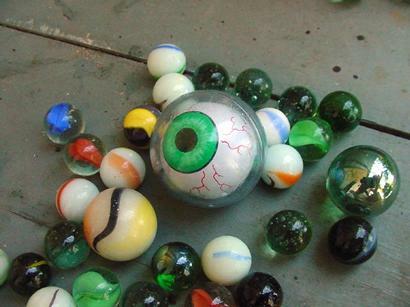 Shootin’ Marbles With Mama’s Glass Eye. I am a very firm believer in keeping the lines of communication open in my family. I try to listen respectfully to my children and I expect the same courtesy from them. I will admit that there were times when they were young and had been telling me for ten or fifteen minutes about the latest exploits of some cartoon character or were trying to explain the Pokeman rules to me when I would have to say, "I’m sorry honey, but I can’t listen to you anymore for a while." "Because my head is going to explode." These days I love to listen to my grown and nearly grown children talk to me. When they will. Other times, I still feel like my head is going to explode. We’d been out to dinner, my youngest son Andy and I. Just us two, this time. Chinese. As we walked across the yard toward the front door Andy said, and I quote, "I feel so sorry for people who are decapitated." This did not throw me. Not an inch. I am an old hand at this kind of opening conversational callisthenic. "Me too," I said. "Wait. That’s not what I meant. I meant people who are quadraplexed," he clarified. "ahh," I answered wisely, as if that cleared up everything. "That’s what it’s called, isn’t it?" he asked. "What?" I was beginning to feel a little dizzy. Kind of the conversational equivalent of dog paddling upstream in a fast current. But I was game. "You know, Mom. When people have two legs." Not only was I dog paddling, but I had a bowling ball in my britches. But it wasn’t the first time. It wasn’t even the first time that day. "Oh, I don’t know. Two seems like a pretty convenient number of legs to me." "Mahhh-umm! You know what I mean!" You see, the problem with Andy is that he is addlepated. He is thirteen and his brain is engulfed in a swirling miasma of hormones. Hormones and Axe body spray. He knows what he means, but the pathways between his brain, his mouth and the rest of the world are all tangled up. Bridge out, no through way, detour ahead. I tensed up. Steeled myself. I knew what was coming. I bet you do too. "Just. Forget. It. Mahhh-um." Like I’m the dumb one. I might be the dumb one. There is some evidence to support that. I got home last night to find that the strong wind had pulled a long strip of our ancient aluminum siding off the house. Not all the way off. One end was still attached. "BOOM! Rattle rattle rattle. BOOM!" Andy tiptoed up from the top step of the back stoop and could just almost reach it. I watched that piece of siding twisting in the wind, saw the last beams of the sunset glinting off the razor sharp edges of it, and smelled disaster. "Get back, Andy! You’re going to get hurt! We’ll just leave it until Daddy gets home." Mother Logic. If anyone was going to get hurt, shouldn’t it be Dad? Huh? Andy shrugged and went back inside. I shuddered and went inside. "BOOM! Rattle rattle rattle. BOOM!" I was able to tolerate it for twenty-eight seconds. Now, I was not employed in the Trauma ICU for six years for nothing. I have seen a whole parade of victims of bizarre household accidents. Safety first! That’s my motto. I put on a pair of oven mits, caught hold of the Scimitar of Death and pulled. It was stubborn. I pulled harder. It came loose. My safety precautions were a moderate success. I only had to get two stitches. Which brings us to this week’s title. We were sitting at the table this afternoon and my husband looked at my wound and said, "Poor Liz! You should have waited for me to get home!" "I’m not Poor Liz," I said. "A quarter of an inch higher and I would have lost an eye! I’m Lucky Liz!" "Yeah," said Andy, getting into the spirit of it, "a quarter of an inch higher and we’d be shooting dice right now." Everybody at the table looked at him. Completely flummoxed. "You know, with Mom’s glass eye." There was a long pause. Mike is an old hand at conversations with the kids too. "You mean ‘shooting marbles’, son." "Just," sighed Andy, "Forget. It."